The Patriots served up a commanding 33-8 win against the Oakland Raiders on Sunday in Mexico City. But while the result was certainly positive, Pats head coach Bill Belichick wasn't too pleased with the experience. Personally, I wouldn’t be in any big rush to do it again,” Belichick said, via WEEI.com. “It’s a long way to go for a game. There’s a lot to it in terms of all the logistics of it. They are not used to having an NFL team so you have to go in there and handle a lot of the logistics. It took a lot of manpower, a lot of hours, a lot of energy out of our organization to do that. This week, we’re tired. We are exhausted from the trip. It was a good trip, but it took a lot out of us, I think. 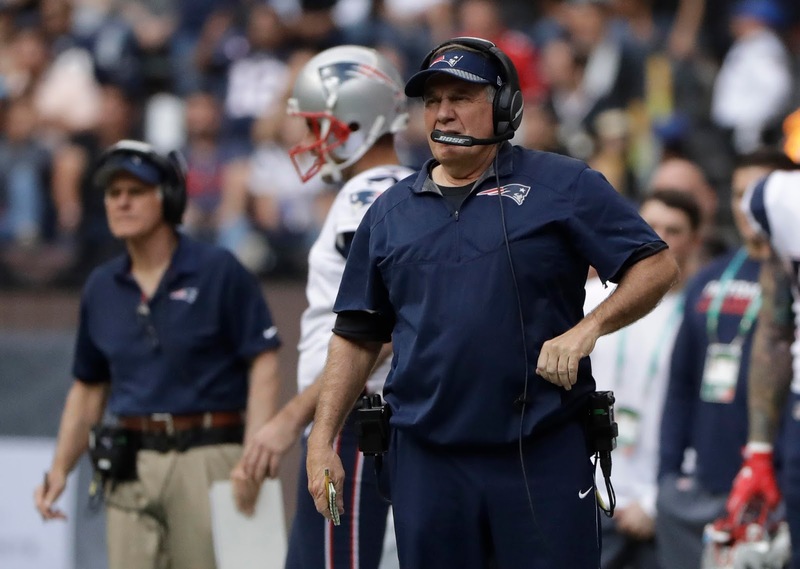 While the team has designated staff to handle logistics and keep that burden off the coaches' minds, organizing practices and acclimating to the environment after already playing on the road the week before must have been the challenge of the season for Belichick and the rest of the team personnel. BB spoke a bit more about the altitude in Mexico City, comparing it to Denver on steroids and noting that it posed extra difficulties regarding food, hydration, and training. While he complemented the players, saying that they "did a great job dealing with all the challenges," they clearly had an effect on Sunday's game: receiver Danny Amendola and cornerback Stephon Gilmore both had to leave with dehydration issues. Finally, Belichick expressed his gratitude that the Pats didn't fall victim to a natural disaster (??) while in the DF. “I think we’re fortunate there was no volcano eruptions, earthquakes or anything else while we were down there. I mean, you have two NFL franchises in an area that I don’t know how stable the geological plates that were below us (were). But nothing happened, so that was good." While the chances of a catastrophic event like an earthquake or eruption occurring on that specific weekend were very slim, it's certainly a blessing both teams were able to enjoy a safe and healthy trip. And while Belichick was rather cynical about the experience, many players welcomed the change of scenery. Tom Brady, for one, called the experience "incredible" and "a privilege" and said that "I'm definitely coming back." Like what you read? Read more by me here, and follow me on Twitter @AidanStenson!